to treat pain. Some, such as codeine, morphine and oxycodone, are prescribed medications. Others, such as heroin or illicit fentanyl, can be produced or obtained illegally. Continuous use of opioids, including for medical purposes, may lead to dependence or opioid use disorder (OUD), especially if taken for an extended period. them. You have to recognize if you have somebody struggling with a substance use issue and then figure out what needs to happen,” says Dr. Bonnie Larson. 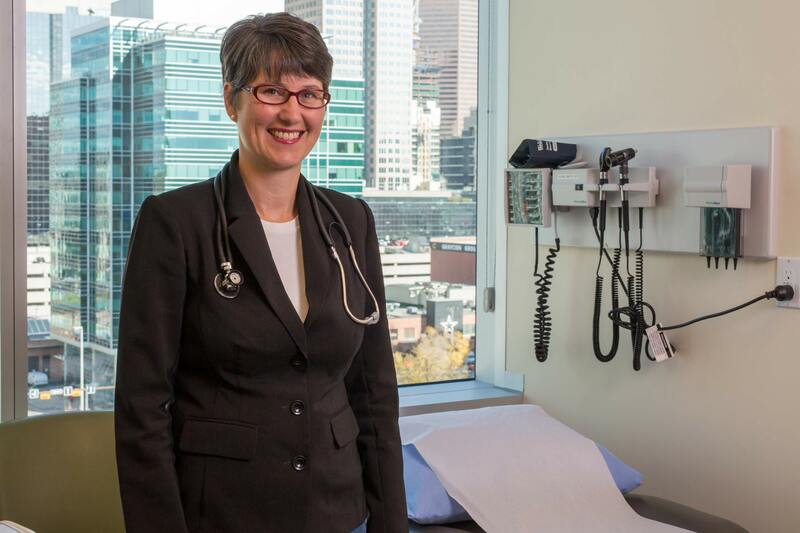 She is a family doctor with CUPS in downtown Calgary and member of the Alberta College of Family Physicians’ Opioid Crisis Response Task Force. “We are putting structures in place over the next 18 months so the medical home can meet these needs for patients,” says Dr. Christine Luelo. She’s a family doctor in south Calgary and physician lead for the Calgary Zone primary health care opioid response initiative grant. The opioid crisis is a highly complex problem that requires a response at every level of the healthcare system—family doctors, community-based agencies, support groups, hospitals and addiction treatment programs. Not everyone who takes an opioid will become addicted, but patients who develop a dependency need understanding and treatment for underlying causes as well as the addiction. Family doctors can be the starting point for getting help. “If you don’t tell your doctor you’re struggling with opioids, they can’t help you. Have that conversation." When Chris*, 29, took his first hit of fentanyl from a friend, he didn’t think much about it. Four months later, opioids consumed his life. He knew he needed help so he went to see Dr. Christine Luelo with the South Calgary PCN, his family doctor since childhood. He asked her to prescribe Suboxone to treat his opioid dependency. Luelo is now the medical lead for the Calgary Zone primary health care opioid response initiative. The group is working with primary care networks across the city to change how family doctors help patients with opioid dependency. She and fellow doctors are changing how they prescribe opioids to reduce the number of patients with opioid use disorder. “I just think about Chris and how we can do better,” she says. As well, Alberta’s family doctors can now prescribe Suboxone, and new training helps them do so confidently and safely. Chris currently gets Suboxone treatment at the Sheldon Chumir Opioid Dependency Program in Calgary. He has not used opioids of any kind since February 2018. Like many people with a drug dependency, Chris did face a wait time for treatment. With family doctors providing treatment and support, more help is available when it’s needed most, when those in need are in crisis. Some treatment programs have waiting lists and family doctors can help support patients while they wait to access specialty care. The goal is to ensure patients feel safe seeking help from their family doctors, and remove the stigma of addiction that may prevent them from getting help. Even though he’s no longer using, Chris still feels judged. “Some people think that if you’re on Suboxone, you’re still an addict,” he says. “But it’s not the same. Suboxone helps me to stay straight. And, it’s definitely safer to be on Suboxone than opioids.” Suboxone is a prescribed treatment and not just one drug replacing another.